1. Takeover talk: It looks like China’s Anbang Insurance is looking to buy a large chunk of America’s hotel industry. Starwood Hotels & Resorts (HOT) — which had previously agreed to be acquired by Marriott (MAR) — said it was in talks with an unnamed group of investors about a potential takeover. Marriott said in a statement that the rival bid comes from a group of investors led by Anbang. The group is offering $ 76 per Starwood share, 9% higher than Starwood’s closing price on Friday. Meanwhile, Anbang appears to be buying more luxury hotels in the U.S. Blackstone Group (BX) is reported to be selling Strategic Hotels & Resorts to the firm for $ 6.5 billion. The Chinese firm is no stranger to the industry. It bought New York’s Waldorf Astoria for nearly $ 2 billion in 2014. 2. Stock market overview: Wall Street traders seem to be reluctant to return to their desks on Monday. 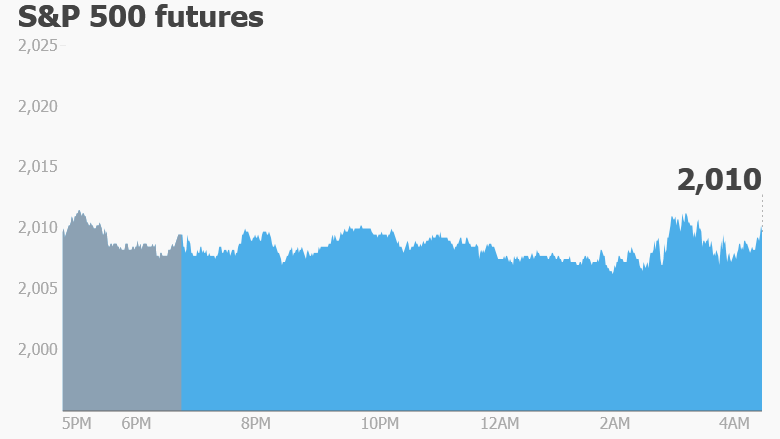 U.S. stock futures are looking soft, even as other global markets rally. European markets are jumping in early trading, while Asian markets all ended the day with gains. 3. Potential market movers: Shares in Fresh Market (TFM) could see higher-than-normal trading volumes after Reuters reported that private equity firm Apollo Global Management is nearing a deal to acquire the specialty grocery chain for $ 1.3 billion. Shares in Devon Energy (DVN) are slipping in premarket trading. S&P Dow Jones Indices announced Friday evening it was removing the company from the S&P 100 index. Its shares have fallen by about 70% since hitting a peak in the summer of 2014. 4. Pound gets propped up: The British pound is surging Monday versus all other major global currencies. It’s rising by about 1.4% versus the U.S. dollar and about 2% versus the Swiss franc. The currency has been sliding since November on concerns that the U.K. may vote to leave the European Union in a referendum in late June. That is creating uncertainty about the country’s economic outlook. Analysts said currency dealers may be tiring of the ‘Brexit’ story and moving to cover short positions in the pound. 5. Commodity commotion: Oil and natural gas prices are slipping on Monday. Crude oil futures are declining by 2% to trade just below $ 38 per barrel. Iran said at the weekend it wouldn’t participate in an OPEC production freeze until it is pumping four million barrels per day. That’s 700,000 barrels per day more than it said it produced in January. Despite the dip, crude is still significantly above a February low when oil was trading around $ 26 per barrel. Market sentiment could shift again when OPEC releases its latest monthly oil report. 6. Friday market recap: The Dow Jones industrial average added 218 points on Friday, ending the day 1.3% higher. The S&P 500 was up 1.6% and the Nasdaq grew 1.9%. This was the fourth consecutive week of gains for the Dow after a period of punishing volatility earlier in the year.